Powder coating is used on a wide array of products. More and more companies specify powder coatings for a high-quality, durable finish, allowing for maximized production, improved efficiencies and simplified environmental compliance. 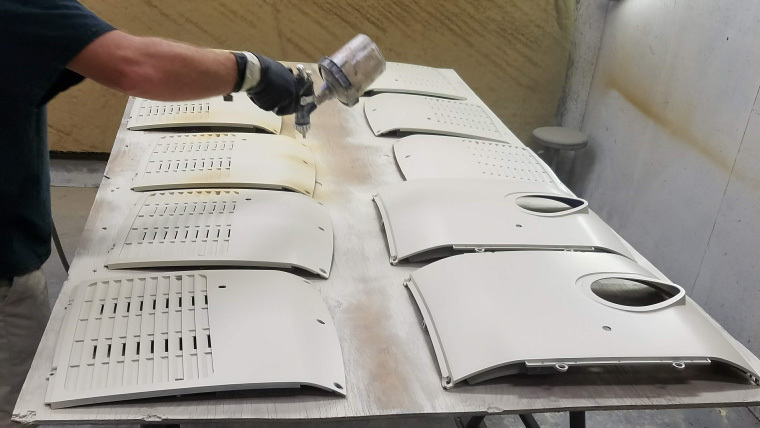 Elite Custom Coatings has one of the largest ovens in the area and can handle powder coating projects of virtually any size. If powder coating is not the right solution, we also have a wet-coat paint department that can cover items made of plastic, and other non-metal materials up to 45′ long. Heavy Duty Equipment: Protect heavy equipment from rust, weather, wear and tear, etc. Manufactured Products: Protect and beautify newly manufactured products made of metal, aluminum and plastic. Vehicle Frames: Protect car frames, hot rod frames, race car frames, roll cages, etc. Auto Parts & Accessories: Protect engine and body parts from road debris and temperature extremes. Metals: Protection from dirt, water, weather, and other rust risks. Consumer Electronics: Prevent damage to sensitive electronic parts. Architectural Products: Prevent corrosion and rusting on railings, awning frames, metal columns, shutters, etc. Cars & Trucks: Protect and beautify body and engine parts from temperature extremes and road debris. Motorcycles, Bicycles & 4 Wheelers: Protect frames, forks, rims, handle bars, etc. General Finishing: Give metal surfaces an attractive, uniform appearance. Generator Covers: Protect your generator from the elements. Appliances: Protection from temperature extremes, grease buildup, lint buildup, etc. Furniture: Prevent indoor and outdoor iron and metal furniture from rusting. Steel Wheels: We do not powder coat aluminum wheels at this time.